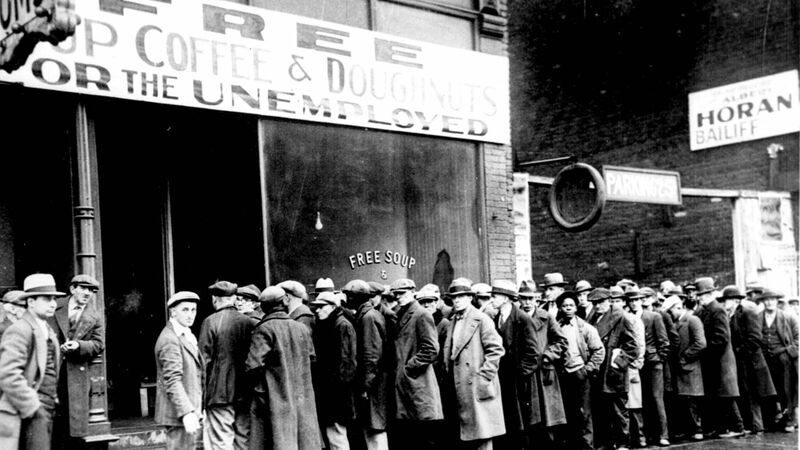 November 1930, five months after Smoot-Hawley: a soup kitchen funded by gangster Al Capone. Photo: Bettmann/Getty. Be smart: President Trump still appears to be winging it, throwing out one extreme idea after another. His latest threat — to do away with NAFTA — may merely be his maximalist negotiating strategy at work. No one — perhaps not even Trump himself — knows. Why it matters: The EU, Mexico and Canada appear to be drawing a hard line in the sand, creating an atmosphere of brinksmanship. And, that comes on top of Trump's rising conflict with China over trade. Yesterday, Mexico imposed tariffs on $3 billion of U.S. pork, cheese and steel, aimed at farmers. "An open trade war has finally erupted in the backyard of the U.S., with potentially dire repercussions for the survival of NAFTA," Eswar Prasad, a Cornell University professor, tells the FT.
Quick take: Until now, this has been a one-way war declared by Trump, who for decades has railed against the supposed negotiating incompetence of U.S. trade officials. Now, as president, he has lurched from crisis to impasse, and yesterday threatened to tear up the quarter-century-old NAFTA treaty, saying that he prefers to negotiate separately with Mexico and Canada. Both U.S. neighbors rejected the idea. The Commerce Department today reported that the U.S. trade deficit fell to a seven-month low in April, to $46.2 billion, reports Reuters' Lucia Mutikani. In addition, Commerce revised the March numbers to a lower figure than previously reported — $47.2 billion, down from $49 billion. When thinkers predict misery and danger as the new wave of automation unfolds, their evidence is often the jobs chaos, flat wages, and hellbent industrialization of the 19th century. Last year, Alibaba CEO Jack Ma said that technological revolution, after all, "caused World War I." What's going on: The 19th century may provide clues for our roboticized future, but Joel Mokyr, a foremost 19th century scholar at Northwestern University, suggests that it's less of a lens than people often presume. An indisputable lesson of the Second Industrial Revolution, just preceding World War I, is that technology can be much more powerful than expected in a combat setting, and seriously amplify and extend a conflict. The tech breakout in steel, mass-production, chemicals, engines and barbed wire "changed the nature of war between 1871 and 1914," Mokyr, author of "A Culture of Growth," tells Axios. The pace of change happened "faster than ever before, and people had not internalized that fact." But where historians and other analysts go too far, Mokyr says, is relating the century's dizzying tech boom and war. "WWI was an epochal event, but linking it mindlessly to technology is playing post hoc ergo propter hoc (after this, therefore because of this)," he said. "The idea that the technological advances of the age led to 'upheaval' and 'disruption,' and that those somehow led to war, strikes me as basically wrong." "The 'flat' wages were not flat, and certainly the beginning of the 'welfare state' can be discerned in many countries. Moreover, unlike now Europeans left behind had a safety valve: free emigration." "Yes, economic change of any kind can lead to disruption and the need to adjust, and creative destruction can cause all kind of suffering. But not war." Americans think that NASA should prioritize detecting asteroids and other objects that could hit the Earth, and not so much returning astronauts to the Moon or Mars, according to a new Pew survey. For the future: Half of the Americans surveyed predicted that humans will be routinely traveling to space as tourists in the next 50 years, but most of them — 58% — don't want to be one of these space tourists, reports Axios' Alison Snyder. Against these findings, Congress has allocated $4.8 billion toward developing technologies to send humans to the Moon and Mars, while less than 1% of NASA's budget goes toward planetary defense. Yes, but: One-third say private companies can advance space exploration. That suggests the relationship between NASA and the commercial space industry is being poorly communicated, says Casey Dreier, The Planetary Society's director of space policy. Last week, we wrote about a perceived turn in artificial intelligence research. Researchers, we reported, have largely paused their work on creating a machine that thinks like a human, and are turning to applications for what's been discovered so far. Your recent article mischaracterizes the current trend in deep learning. (1) There's sufficient advance in deep learning to invest in faster and more efficient hardware (see DL specific hardware by Nvidia, Google and Microsoft). (2) There are identified short comings in DL that alternative novel solutions need to be explored. See Hinton's Capule's network. To say that researchers are halting work on human-like machines is very far from reality. This area of work is in fact accelerating. Let us know your thoughts too. Smallish towns and states, hollowed out by demographics and urbanization, are not giving up: they are gathering together local dollars in what amount to signing bonuses to move. If you move to Vermont, the fastest-aging state in the U.S., you can get a $10,000 grant over two years to cover relocation and other moving and settling-in expenses, writes Quartz's Corinne Purtill. And St. Clair County, Mich. (pictured above), is offering $15,000 if you earned a STEM degree in the last 10 years, reports LinkedIn's Chip Cutter. Randy Maiers, who directs the foundation overseeing the St. Clair program, tells Axios that he doesn't feel he is in competition with other places also seeking new residents. "This is a 'come home' award primarily for people with family ties to our region," he said. Those who have already availed of the St. Clair grants include: "a teacher, a veterinarian, a speech pathologist and a medical laboratory scientist," Cutter writes.